Exit tickets are not a new idea by any means. I have been aware of exit tickets for many years of my teaching but must confess I have not used them. I must say I don’t really know why, I just preferred other activities for plenaries. A new colleague of mine shared an exit ticket and I was talking to them about it. I decided to give an exit ticket a try and get out of my plenary ‘rut’ sort of speak. 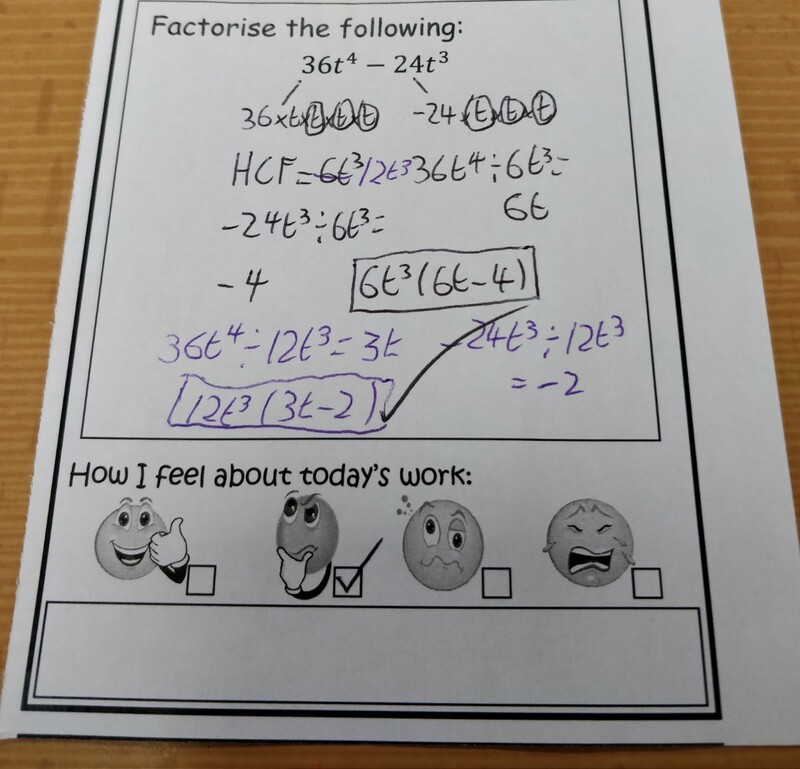 I decided a great opportunity was with my year 9 students when we had been looking at how to factorise more complex expressions. I planned my lesson and activities and so had my examples and questions in mind when I was creating my exit ticket. I also remembered a great piece of advice from Mr Barton in his book ‘How I wish I had taught maths’ which is that the plenary can potentially be the 5 minutes of our lesson that students really remember. He suggested that a plenary may not be a time to introduce a problem solving type question or an exam question but instead a question that will actually build the students confidence and allow them to leave the room feeling that they have achieved something and remember that final question that they could answer. With this in the back of my mind I chose my question carefully for the exit ticket. I handed out the exit tickets at the end of the lesson and asked the students to bring them to my desk before they left. I know some teachers chose to check them once the students have gone but I decided to check the tickets whilst the student was there and had conversations with students if necessary and asked them to make any corrections there and then. Of course you could just ask for a pile on your desk and then check them in your own time ready for the next lesson. The top left exit ticket is an example of a very small mistake that a few of my students made which was that they had placed a plus sign between the terms instead of a negative because the second term is negative. This mistake was very quickly rectified by me simply asking ‘why is your second term in the bracket positive?’. 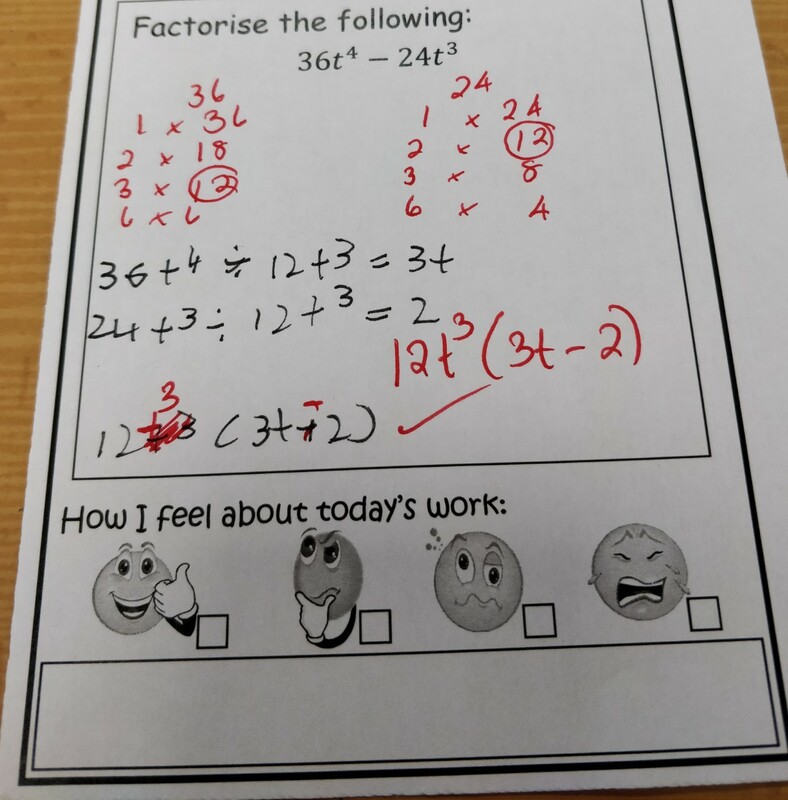 The top left exit ticket was again an example that I saw and showed that this student had understood the concept of factorising but had not selected the highest common factor. Again, I just had to point out that the terms in the bracket had a common factor greater than 1 therefore this was not fully factorised. 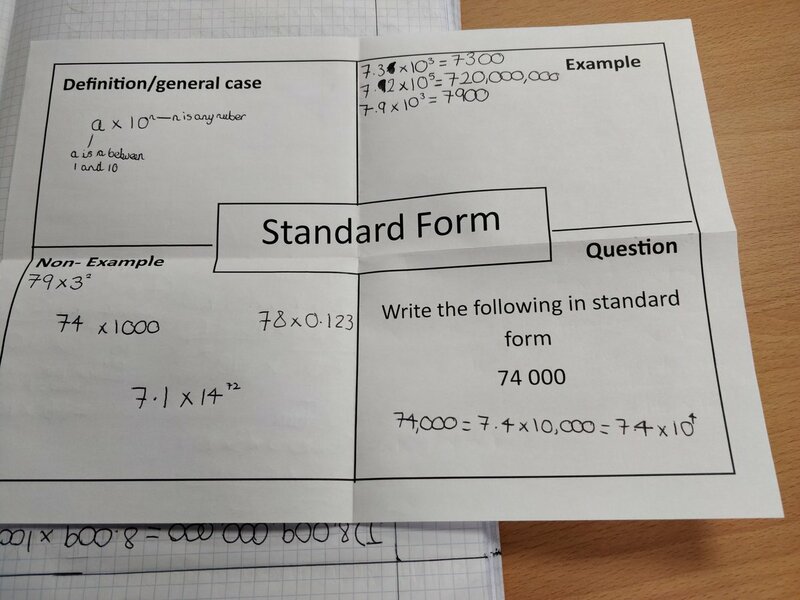 The bottom example is one of a student who had struggled more and therefore a more detailed conversation was needed and I had to help guide the student more. I definitely think that this exit ticket brought a great insight into what my students had truly understood. It also helped me decide upon what to use for my next starter. 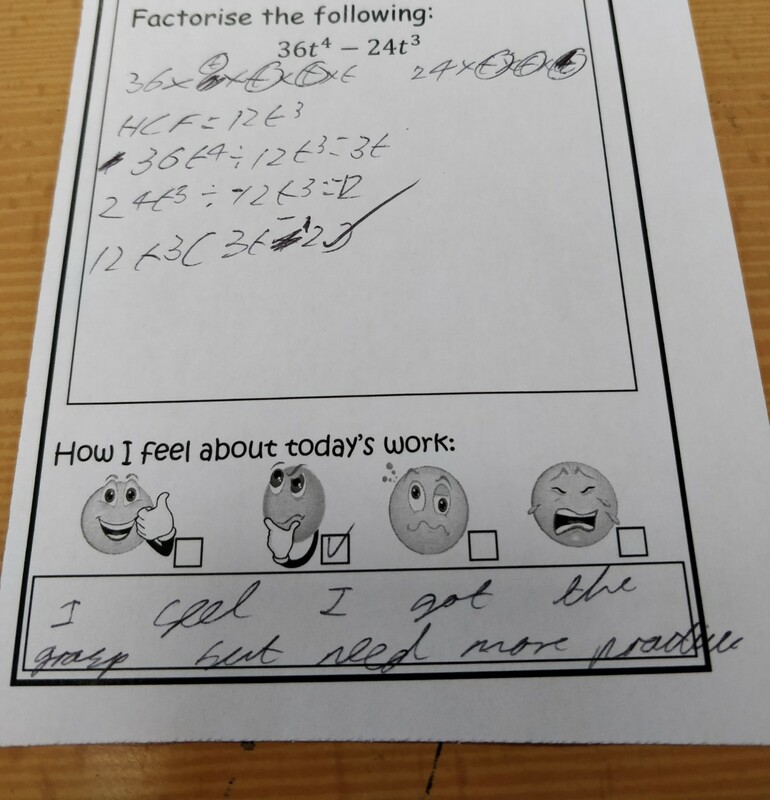 It had become apparent from the exit tickets that some students had struggled with identifying the highest common factor of numbers, some had struggled with the highest common factor being a letter that is not linear and some had made mistakes with the second term being negative. My next starter addressed these issues and was designed to help students rectify these areas. In the same lesson that I used this starter I handed back the exit tickets and asked my students to stick them in their books. Overall, I certainly feel the exit ticket was a valuable plenary. The ticket itself did not take long for me to make. I already had the template and then printed 4 to a page and just had to print and cut them out. 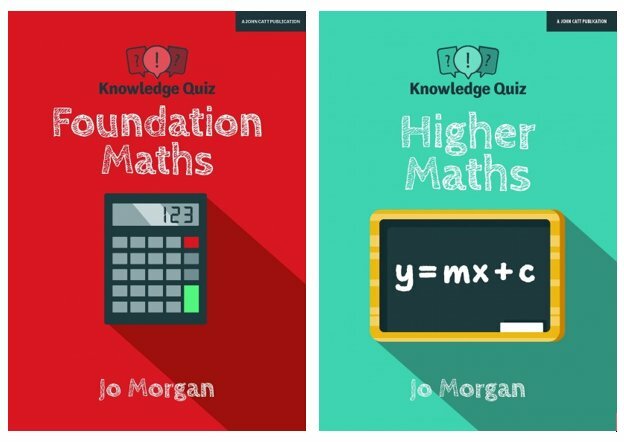 The information I was able to glean from them in a matter of minutes was excellent and certainly allowed me to really understand which of my students understood the lesson and which had struggled. It also gave my students the opportunity to decide how confident they felt. I would recommend using an exit ticket for a plenary.